A hands-on, developmentally driven approach to word study that shows teachers how to integrate and teach PreK and kindergarten children phonics, vocabulary, and spelling skills. Based on the core philosophy of Words Their Way®: Word Study for Phonics, Vocabulary and Spelling Instruction, the highly popular resource that has helped thousands of children improve their literacy skills, this book provides an in-depth guide to teaching young children the foundations of literacy in developmentally appropriate ways. Words Their Way®: Word Study for Phonics, Vocabulary and Spelling Instruction has become a best seller in the world of in-service and pre-service education. Now the authors have taken that popular guide and created a book specifically devoted to the critical early years: Words Their Way® for PreK-K. By promoting the core philosophy of Words Their Way®–that word study is developmental in nature and instruction should reflect that development–Words Their Way® for PreK-K devotes whole chapters to each crucial component of a research-based literacy program, including: oral language development, alphabet, phonological awareness, concepts about print, phonics, and helping children develop a concept of word and word recognition. Throughout, the authors present well-established instructional strategies, activities, and detailed lesson plans that reference the Common Core State Standards for English Language Arts, An outstanding online assessment tool, PDToolKit, is available to purchasers of the book. Rich, online resources to help teachers implement a complete literacy program, including access to PDToolkit. Hands-on, developmentally appropriate, research-based information that guides teachers in working effectively with students individually. Complete coverage of the foundations of literacy in an approach that’s accessible for both pre- and in-service teachers. Spot-on lesson plans designed to keep teachers on top of working with the Common Core State Standards for kindergarten. 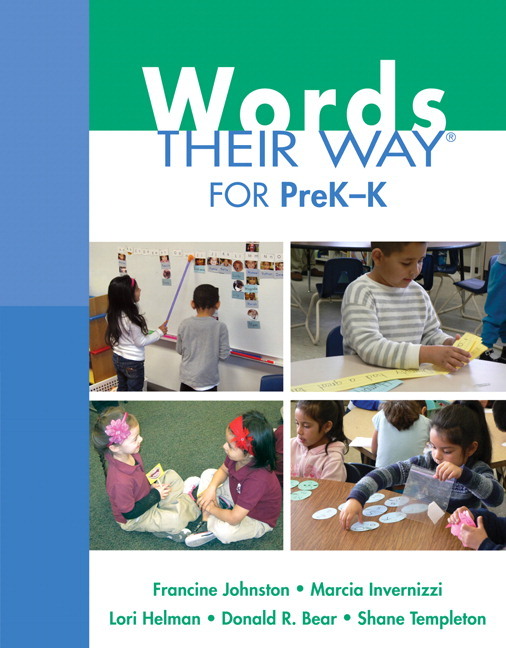 Words Their Way for PreK-K is full of great educational lessons and resources. There are lessons on all major topics, which allow our pre-service teachers to expand their lesson galleries. It includes children’s books to use in the classroom, of which there can never be too many. The stories from actual classrooms and the writing’s casual tone help to make the text less intimidating and more teacher-friendly. Tools for teaching, featuring an enhanced assessment application tool with user-friendly navigation; instructional strategies/ create-our-own word sorts tool; and hundreds of additional word sorts, games, and templates. How-to classroom videos showing authentic implementation of the Words Their Way® approach. How to integrate and teach children phonics, vocabulary, and spelling skills. How to work in each child’s “zone of proximal development. How to provide instruction that is developmentally appropriate and research based. Support for building a firm understanding of the critical components of a literacy program is ensured through the comprehensive, in-depth coverage of the foundations incorporated into every chapter. Teachers get a clear description of preK and K literacy, extremely important in helping to develop competent readers. Accessible and grounded in research, the book includes numerous activities, lesson plans, letters for encouraging parental involvement and home/school communication, and many additional resources. Readers get practical help and background for understanding the purpose of many activities they can choose from in their work with children.